The Microsoft Australia Press Shop is currently having a MASIVE sale with 50% OFF ALL BOOKS before the end of financial year (June 30th). To claim you discount for this incredible deal simply use the checkout code EOFYS10 and the discount will automatically be applied to your cart. If you do live in Australia remember that even after this great deal is over the Microsoft Press Shop will always price match any book you can buy from Amazon (with conversion and shipping) with their Amazon Price Match Promise. I have always found their service to be excellent and the delivery has always been within two days as their warehouse is based locally in Sydney. If you are having trouble what title you are after then I highly recommend the Configuring Windows 7 Self-Paced Training Kit for MCTS Exam 70-680 by fellow Australia MVP Orin Thomas & Ian McLean. 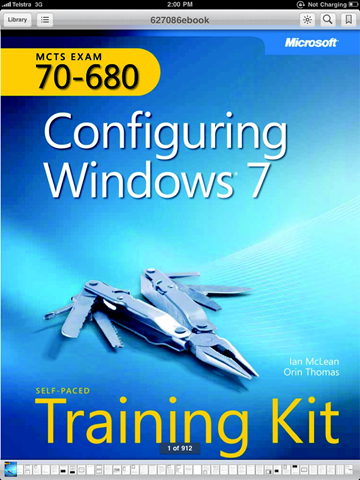 Even if you are not planning to do the exam that this book is written for it is still a great guide for anyone who wants to brush up on what is new in Windows 7. The other great think I love about MS Press books is they come with a PDF version which you can now copy to your iPad or iPhone and read in iBook’s which recently enabled native PDF support (see below).